HOLIKE Air Cooler is your Personal Space Air Cooler Conditioner Fan! It can humidify the air and purify the air. It uses the principle of evaporation to absorb heat, can cool down in hot weather. It only uses daily cold water and does not need Freon, so it is healthier. 1.Keep your Air Cooler balanced first. 2.Opening the water tank and fill with pure water. If you are willing, you can also add some small ice cubes or essential oil. 3. Connect the power supply and air cooler with the USB cable. 4.Press Power button to power on the Air Conditioner. 5.Set the Fan Speed via pressing button. You can select Low-Medium-High Mode. 6. Press the light button to select the color you like. You can select a solid color or a color circulation mode, or off the light. -Product Size: 6.5" X 6.5" X 6.7"
- There are USB Charging Cable and USB Adapter in the package, please rest assured to buy. - Air cooler is designed for individuals, and can not cool the entire room. - Air cooler must be kept on a level surface during use; tilting the unit may cause water to leak out of the base. - Let filter absorb water for at least 3 minutes after filling tank and before use. Doing so will get you the coolest air quicker. - If you have any products quality problems, Please contact our Customer Service Team. We will help you solve the problem for the first time. Please don't worry! Providing you with cool fresh air and colorful summers. 【3-in-1 Air Cooler】HOLIKE evaporative air cooler combines cooling, humidifying and purifying air functions in one, helps you to create a personal comfort zone. The air cooler increases the moisture in the air, protect you from the dry air in the hot summer, to enjoy your moist cooling summer. 【Eco-friendly & Cost Effective】No freon needed. This mini air conditioner fan turns everyday cold water via a special filter into cool and clean air. 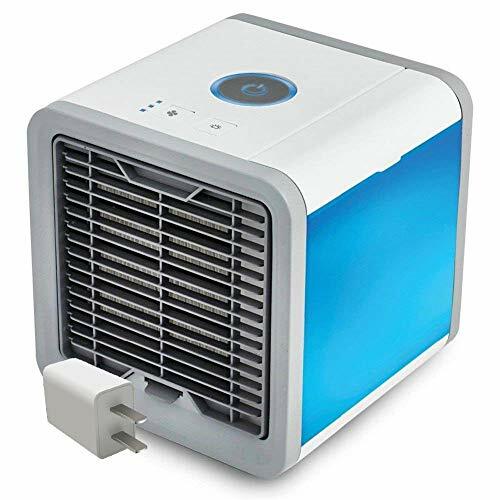 Equipped with a USB adapter, the Air cooler can be connected directly to a power source or connected to a computer or other device. Besides, using 10w working power via USB, it only consumes a little power. 【3 Adjustable Speeds】: There are 3 gear wind speeds for your choice. The speed can be adjusted among (low, medium, high ). You can choose the most comfortable one according to your feeling. 【7 Colors LED Lights】: The built-in colorful soft LED light not only can create romantic atmosphere, but help you with better sleep. You could set it on one color you like, 7 color-cycle modes, or switch off directly. 【Portable & Simple in Use】: Easy operating: just add water, plug power on, and turn it on. Micro USB cable needs to be connected when work. Compact personal air cooler is small size and lightweight, you can easily take it around with you to use in any occasion. If you have any questions about this product by HOLIKE, contact us by completing and submitting the form below. If you are looking for a specif part number, please include it with your message.